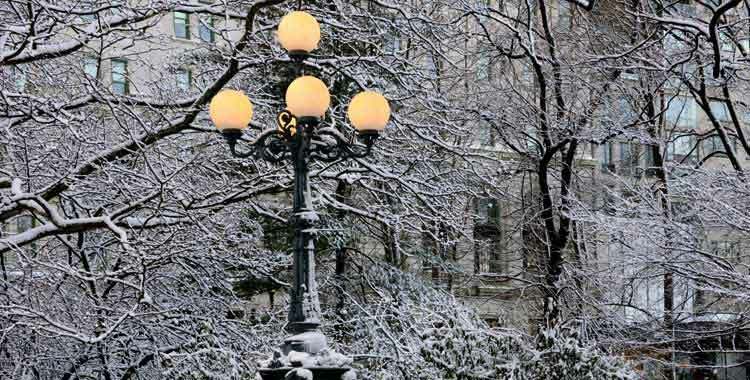 A charming touch of old world Germany, the Lombard Lamp illuminates this corner of Central Park where a long, winding staircase leads up from the Pond to the Grand Army Plaza. A replica of the ornate streetlights that grace the Lombard Bridge in Hamburg, Germany, the lamp was presented to Central Park in 1979 — a symbolic gift of friendship and goodwill from officials of that city. The cast-iron and aluminum frame weighs in at 1,320 pounds and features five round lamps. Cherubs and garlands decorate its square base. A Lombard replica was gifted to one other U.S. city the same year: Chicago. The twin model still lights up its Lincoln Square neighborhood. East Side Perimeter Wall at the Grand Army Plaza entrance to The Pond at Fifth Avenue and 60th Street.